The story of the Prisoner's Dilemma is no doubt the most widely known example of game theory. In the prisoner's dilemma, it is assumed that when given a choice whether to cooperate or betray someone, people may benefit as individuals more by choosing the latter, as opposed to cooperating and delivering a mutual solution that benefits both parties. In business, the opportunity to choose one's benefits over those of your customer can come into play with every business deal, with every product introduction or feature change, or becomes especially tempting at the end of a sales quarter. But as companies choose their own benefits over those of their customers too frequently, any relationship that previously existed can be permanently damaged, to the long-term loss of business. Similarly, as customers look to take advantage of a business, be it through theft of their products, or other bending of the rules, so too can trust and relationship be eroded from the opposite side, despite any short term benefits the customer may have received through free products, unapproved functionality, etc. The ideal win-win solution is for the company to produce high quality products that bring benefit to customers, and do so in a transparent and trusted fashion, working to put the customers' success in line with their own. It may sound like an unrealistic utopia in a world of capitalism, but as I watch Google closely, I wonder if their "Do No Evil" strategy could be part of the company's game theory that has them siding with consumers in virtually every case, driving up increased success for both parties. Lest I be accused of seeing through the world through Mountain View donated multi-colored glasses, consider how Google sees their own products. As with many tech companies, Google uses internal codenames to refer to their products before they have been released to the public. For those who know their Greek mythology, Prometheus was known for stealing fire from the Greek god Zeus, and giving it to mere mortals. Prometheus was also known for making people powerful by teaching them valuable skills. For Google, the act of releasing Google App Engine was the equivalent of giving fire to mortals, power to the people. This delivery of "fire" is a clear win for engineers looking to leverage Google's tremendous infrastructure and tool set. Instead of keeping the advantages close to the vest, as could be dictated by traditional game theory, Google opted to "Not Be Evil" and released Prometheus. You could see this again with their recent release of Closure Tools in November. More fire to the people. More tools and more skills. Google is a business, not a charity, so they need to compete aggressively in those areas that deliver them significant profits, namely search and advertising. But the company, in parallel, is driving dozens upon dozens of Web services that are speeding up the Web, helping companies know more about their own Web sites and communicate more easily. The company employs many different employees, who in theory, don't directly contribute to the bottom line in a significant way. But what they do is improve the quality of life on the Web. The company can afford to do this because their for-profit businesses are so successful, but when they do get the opportunity to "Do Evil", or at least stop being charitable, they aren't. 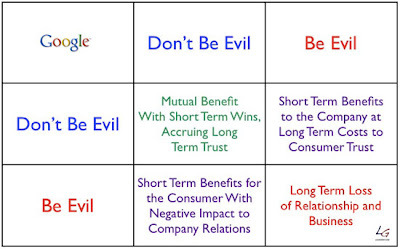 I believe that this approach of mutually beneficial cooperation, in the upper left quadrant of the prisoner's dilemma, and consistent execution on this approach, is part of why Google, for the most part, is trusted, while other companies are not, seen for having chosen their own best interests ahead of their customers. Prometheus gave power to the people. Prometheus delivered fire to the mortals. Google's approach to game theory, playing the role of Prometheus, is part of why I am so bullish on what they are doing.